The NewTek TriCaster is an excellent product for doing a multicamera production and streaming to Ustream. There are different ways to configure your TriCaster to stream to IBM Watson Media, depending on which TriCaster model and which TriCaster software version you have. UPDATE: We have discovered that connecting via the Ustream plugin, or logging in with your Ustream credentials, will cause broadcasting issues. To avoid this, please connect via Manual RTMP configuration. If you have one of the newest TriCaster models, but don't have the Ustream plugin installed, or if you prefer not to use the Ustream plugin, you can use the following manual RTMP configuration method to stream to Ustream. In the top left of this window, choose Ustream from the connection menu, then click the New button to create a new streaming connection. In the dialog that pops up, choose Adobe Flash. This should reveal additional configuration fields in the top of the browswer window. If it doesn't, unfold the arrow in the top left of the window, or try modifying another connection that already displays these fields. 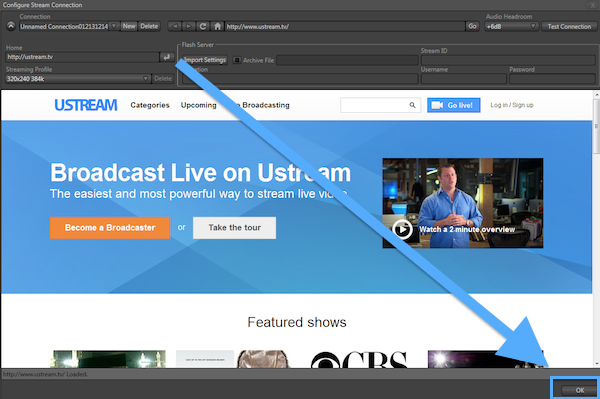 The browser should already be on the homepage of Ustream at http://www.ustream.tv If it's not, use the browser URL bar to load http://www.ustream.tv in the browser. 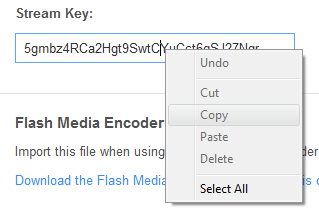 Then click on Encoder Settings. The remote page in your dashboard contains the RTMP address and the stream name that you need to point your TriCaster to send the stream to. Copy and paste these values into the correct fields in the top bar of the window. Paste the RTMP URL into the Location field. 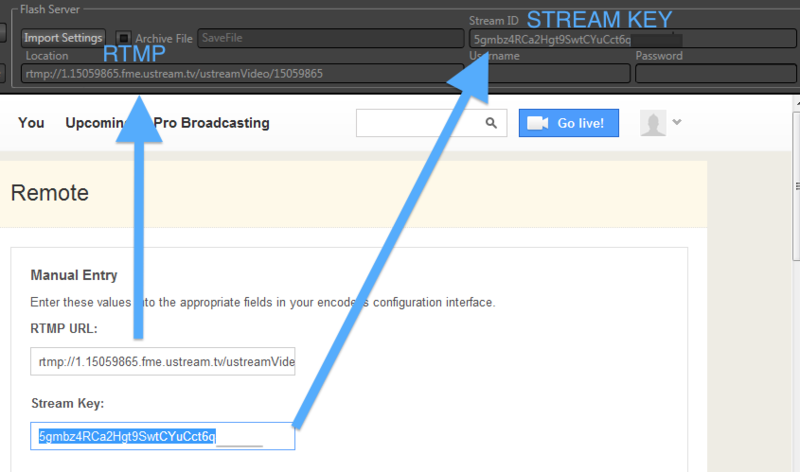 Paste the Stream Key into the Stream ID field. Next, choose which resolution and bitrate you'd like to stream at from the Streaming Profile dropdown. We recommend choosing a preset that matches Ustream's recommended streaming settings and that is feasible within the bandwidth you have available. 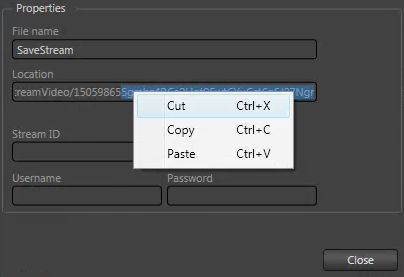 We also recommend only using presets that appear in the default settings for your TriCaster. Each TriCaster model varies in terms of its encoding power and custom presets are not officially supported by NewTek or Ustream. We recommend only using a preset that is available by default on your model of TriCaster and not try to push your TriCaster beyond what is available in the list. Creating custom presets at higher resolutions or bitrates than what is available by default may result in dropped frames, audio/video sync issues or choppy streams. It is strongly encouraged that you do a speed test on the internet connection that your TriCaster is connected to and you base the preset you choose on the bandwidth you have available. We recommend you have a dedicated line with 2x the bandwidth that the streaming preset uses. For example, if you choose 720p High bandwidth, it uses a total of 2.1Mbps video + audio bitrate, so we recommend you have 4-5Mbps of dedicated upload speed available. Choosing a preset that is too high for your available bandwidth may result in frame drops, buffering or disconnects. Know your upload speed and choose your preset carefully to ensure a quality, uninterrupted stream. Note that the username and password fields should be left blank. Click Ok in the bottom right to exit back out to the main TriCaster window. Now you are back on the TriCaster main window and ready to start streaming. Click the Stream button to start streaming to Ustream! 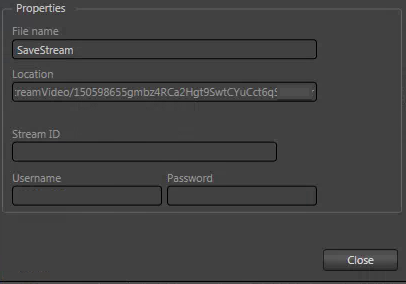 First, you'll need to obtain the RTMP address and stream key for the channel you want to stream to. The older TriCaster models do not have a built in web browser, so you'll need to exit out of the TriCaster software to the Windows desktop and use a web browser there. 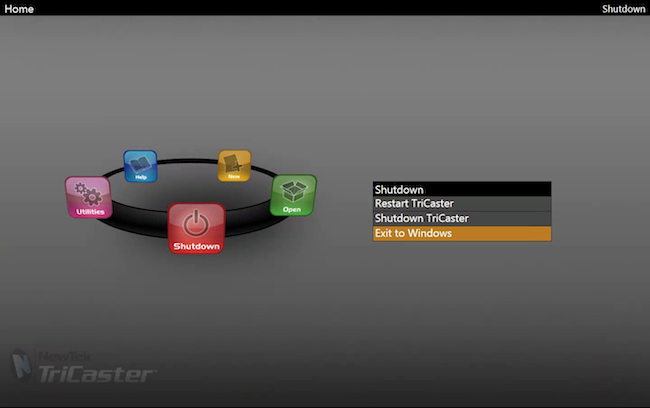 Click the X in the top right of the main TriCaster window to exit to Windows. The remote page in your dashboard contains the RTMP address and the stream name that you need to point your TriCaster to send the stream to. Since your clipboard can only hold one value at a time, we recommend appending both into a single string and then splitting them back out into two separate strings. The other option is to do this process on a separate computer and visually copy the values, but we do not recommend this as it is easy to make transcription errors when doing this. Open a blank document in a plain text editor, such as Wordpad, or any text editor you like. Paste this string at the end of the RTMP URL and make note of where the RTMP URL ends and where the Stream Key begins. Now copy the entire string. 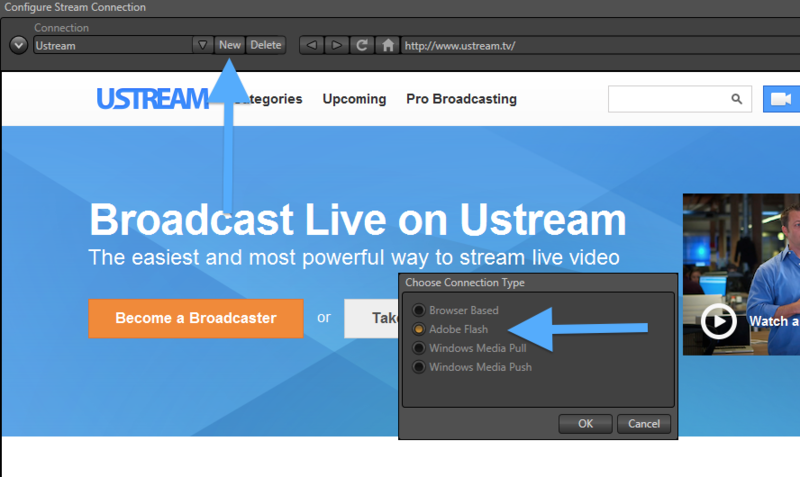 In the pop up window, choose Adobe Flash and which preset you want to want to stream at. We recommend choosing a preset that matches Ustream's recommended streaming settings and that is feasible within the bandwidth you have available. 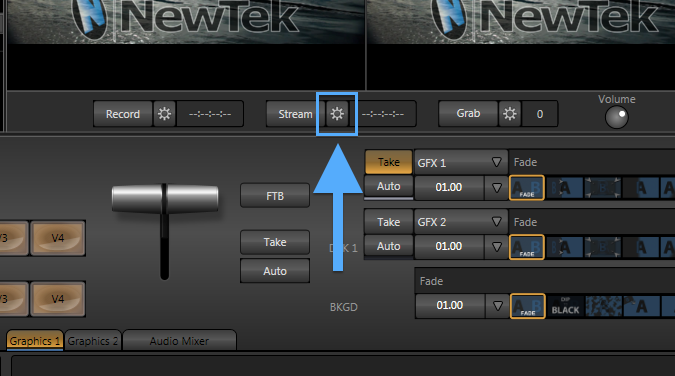 We also recommend only using presets that appear in the default settings for your TriCaster. Each TriCaster model varies in terms of its encoding power and custom presets are not officially supported by NewTek or Ustream. We recommend only using a preset that is available by default on your model of TriCaster and not try to push your TriCaster beyond what is available in the list. Creating custom presets at higher resolutions or bitrates than what is available by default may result in dropped frames, audio/video sync issues or choppy streams. It is strongly encouraged that you do a speed test on the internet connection that your TriCaster is connected to and you base the preset you choose on the bandwidth you have available. We recommend you have a dedicated line with 2x the bandwidth that the streaming preset uses. For example, if you choose 720p High bandwidth, it uses a total of 2.1Mbps video + audio bitrate, so we recommend you have 4-5Mbps of dedicated upload speed available. Choosing a preset that is too high for your available bandwidth may result in frame drops, buffering or disconnects. Know your upload speed and choose your preset carefully to ensure a quality, uninterrupted stream. In the bottom section of the configuration window, paste your combined RTMP address and Stream Key string into the field labelled Location. 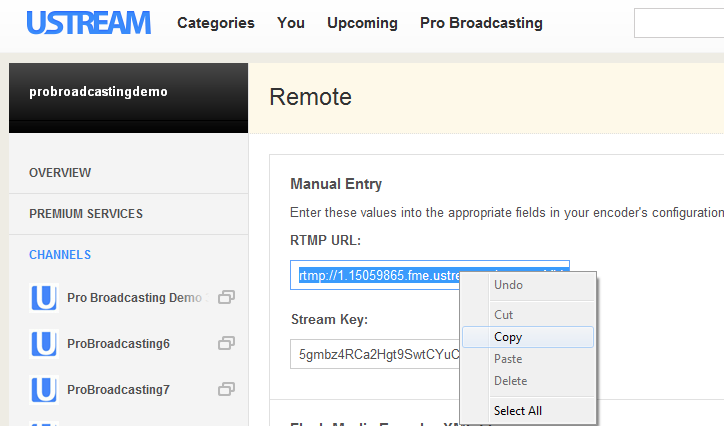 You should now have your RTMP Address pasted into the Location field and the Stream Key pasted into the Stream ID field. Visually check both against what you see in your Ustream dashboard to ensure you have made no errors when copying and pasting these values (e.g. you didn't cut off any letters at the end, paste twice, leave a space at the end etc. ) 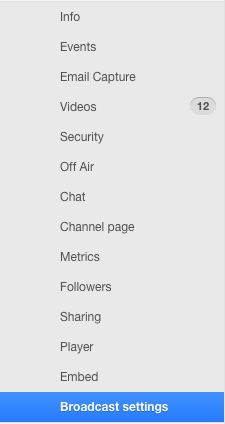 If there are ANY errors in these values, you will not be able to publish your live stream to your Ustream channel. Errors in the RTMP address will display an error in the TriCaster. Errors in the Stream Key will result in the stream not publishing (i.e. 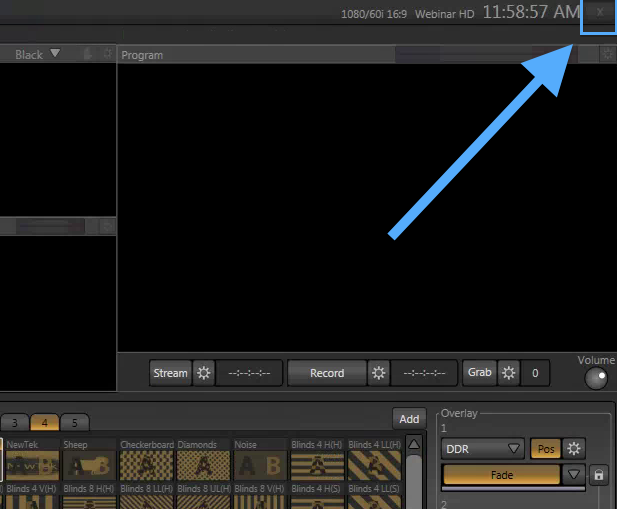 "black player window") but you will not necessarily see an error in your TriCaster. Please note, as you see in the picture below, you can leave the Username and Password fields blank. 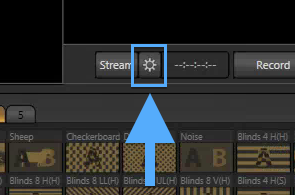 Click Close to exit the streaming configuration window. TriCaster Studio and TriCaster Broadcast are the oldest models of the TriCaster product line that support streaming to Ustream. Follow the instructions provided above for obtaining your RTMP address and Stream Key and copying them in a single string to your clipboard. Once you have done this, open the TriCaster software. 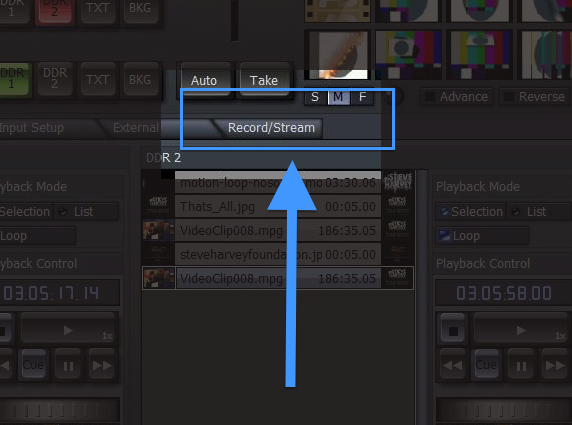 Click on the Record / Stream tab in the main TriCaster interface. 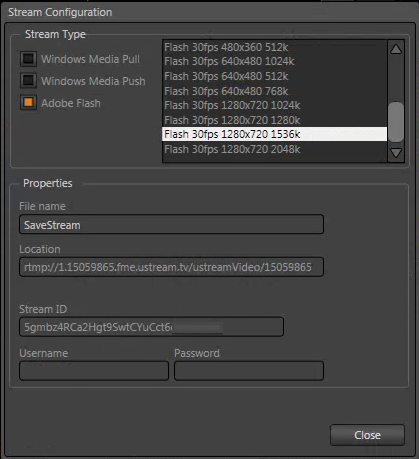 Under Stream Type, choose a preset that starts with push: Flash. This is the only type of streaming from the TriCaster supported by Ustream. Within the push: Flash presets, you will see different resolutions and bitrates to choose from. We recommend choosing a preset that matches Ustream's recommended streaming settings and that is feasible within the bandwidth you have available. 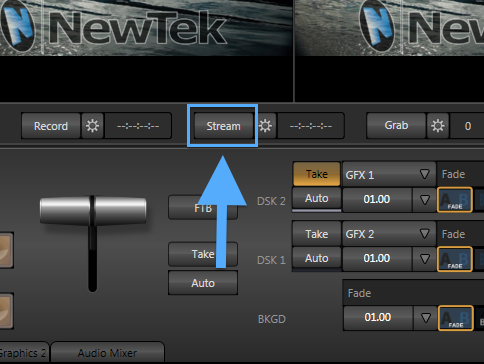 We also recommend only using presets that appear in the default settings for your TriCaster. Each TriCaster model varies in terms of its encoding power and custom presets are not officially supported by NewTek or Ustream. We recommend only using a preset that is available by default on your model of TriCaster and not try to push your TriCaster beyond what is available in the list. Creating custom presets at higher resolutions or bitrates than what is available by default may result in dropped frames, audio/video sync issues or choppy streams. It is strongly encouraged that you do a speed test on the internet connection that your TriCaster is connected to and you base the preset you choose on the bandwidth you have available. We recommend you have a dedicated line with 2x the bandwidth that the streaming preset uses. For example, if you choose 720p High bandwidth, it uses a total of 2.1Mbps video + audio bitrate, so we recommend you have 4-5Mbps of dedicated upload speed available. 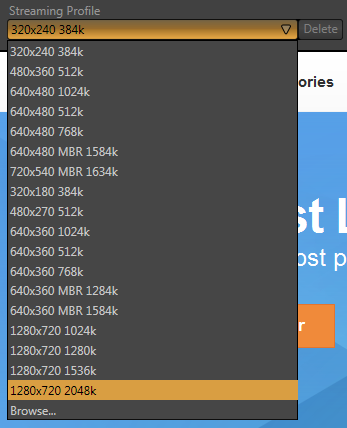 Choosing a preset that is too high for your available bandwidth may result in frame drops, buffering or disconnects. Know your upload speed and choose your preset carefully to ensure a quality, uninterrupted stream. 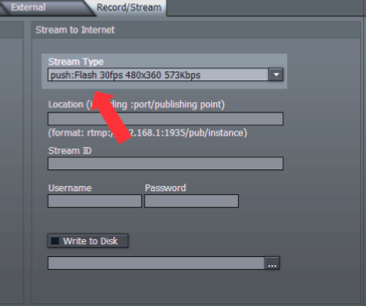 Paste your RTMP address and Stream Key into the Location and Stream ID fields following the instructions provided above. Now you're ready to stream. 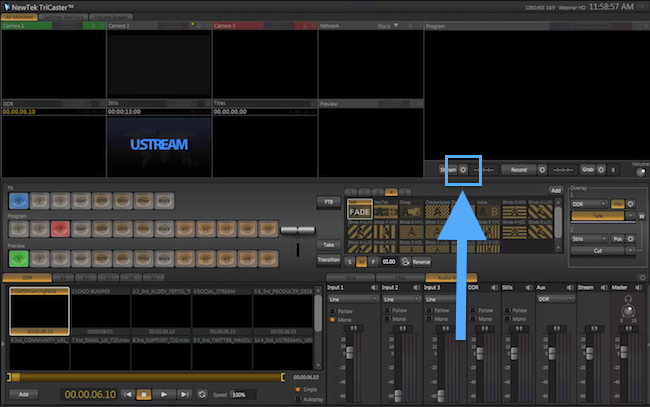 To begin streaming to Ustream, click the button in the lower left of the TriCaster interface that says Stream Live Output.The button will illuminate red while your stream is live.